The Auburn Family and by extension the Never to Yield Foundation has no dog in the Johnny Manziel hysteria currently burning holes in the ESPN ticker. It’s not our fight, not our problem and none of our concern. 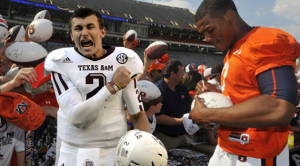 We can’t help but notice, however, that the hounds baying along Johnny Football’s trail are some of the same barking mongrels who pursued every possible Auburn angle from the moment Cam Newton dared to ascend to something bordering on superhuman. We’ve been there before and we feel your pain. At the forefront of the Manziel hysteria there’s Joe “No Sources” Schad, whose (lack of) reporting accuracy eventually earned him an admonishment from ESPN. Schad’s record of quality reporting is suspect at best. Hot on his heels is Selena “Please Look At Me, I’m Desperate” Roberts, who crashed and burned from the New York Times to a barely coherent blog cooked up with her dog on her back porch. Despite a string of epic reporting failures, ESPN brought this hack on board to comment on the Manziel investigation. And then there’s Alabama-bred lawyer John “Photoshop” Phillips, he of the doctored defamatory-toward-Auburn videos who is attempting to broker the sale of photos that allegedly show Manziel signing autographs. Note: Phillips apparently does not have access to any of the treasure trove of T-Town Menswear jersey/helmet/glove/photo signing images floating around the Internet. Who’s next to gig the Aggies with pitchforks and torches? Will Scott Moore emerge from his involuntary isolation to offer tapes? Has Danny Sheridan risen from his coffin to have tea and crumpets with Manziel’s Aggie bag man? How long before the Internet underworld boils with “As the Aggies Gag” websites? At what point will Catfishes and other slimy creatures organize hush-puppy dinners to display convoluted flow charts detailing the sordid history of Texas A&M and its ties to the Mexican drug cartels? Does Andrea Kremer have an expose into Aggie culture in the works? Forgive us, Aggie fans. We’ve seen all this before. There’s a world of difference between the off-field demeanor and maturity shown by our Heisman Trophy winner and record-setting NFL quarterback Cam Newton and the reckless party-first behavior allegedly exhibited by your freshman Heisman winner Manziel. We don’t know if Manziel participated in the actions of which he is accused or not. But the hysterical pursuit of your guy by the drooling media pack is terribly familiar to us. We’ve endured it. Probe after probe, allegation after allegation, we survived it all. Survived and were exonerated. But here’s something to remember: The truth doesn’t matter. Your quarterback and your program are already convicted no matter what the outcome of the investigation. Cam Newton, Auburn University and the Auburn Athletic Department were each thoroughly investigated on numerous occasions. Every single investigation turned up nothing. Absolutely nothing. Now ask yourself: What’s your perception of Auburn today? We wish you well as you suffer the same hysterical hunt. We hope for the sake of the league that it all amounts to nothing. But the damage is already done. The people who are orchestrating this assault have already achieved their objective. Chaos has been sewn. Your name has been besmirched. Welcome to the SEC West.